Divorce and Family separation is one of the worst phases to go through. 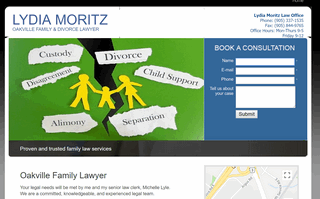 Lydia Moritz is an established family and divorce lawyer in Oakville. She has helped many families settle their disputes, divorces and separation smoothly through legal procedures. You book her consultation for your family and divorce settlement or for child support at https://www.oakvillefamilylawyers.ca/. Your legal needs will be met by the strong and committed team of Lydia Moritz and her senior law clerk, Michelle Lyle. Lydia has practiced law for over 20 years and Michelle has worked with Lydia as her senior law clerk for most of those years.